Remember how I wrote about sampling some Autumn Olive fruits a couple of months ago? I liked the flavor initially, but not the aftertaste. So I wasn't too keen on trying my movie star neighbor's Autumn Olive fruit leather. Boy was I wrong! The beautiful leather was sweet, tart, and delicious, with no strange aftertaste at all. My neighbor's recipe is almost too simple to post about. 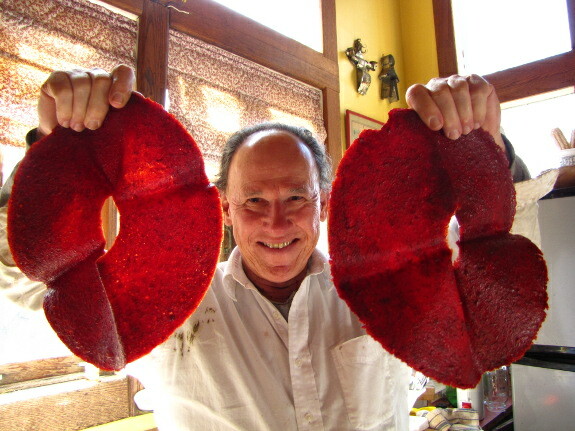 He just sent the fruits through a foley mill to remove the seeds and mash them up, then dried them in his dehydrator. No added lemon juice or sweetener of any sort. I'm only guessing, but I suspect the aftertaste I didn't like was in the seeds, which is why the leather was pure ambrosia. 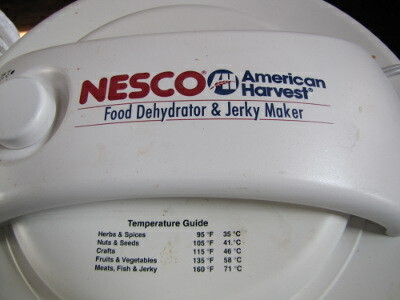 As a side note, our neighbor loves his American Harvest dehydrator. It's round like those cheap ones that do nothing, but has heating elements at the top and a fan to force air through the trays. If you don't want to spring for the top of the line Excalibur dehydrator we chose, this might be a good second best. Our chicken waterer makes it easy to go out of town without worrying about your flock. Hmmm... I feel the same way about persimmons RE: aftertaste. I wonder if drying them would take care of that. You might look for different varieties too. The native American persimmons are astringent if not entirely ripe, and some are more astringent than others. Perhaps if you tried a named variety? I tried whatever was growing next to our field. The tree is HUGE! But I should say the foretaste was good, but the aftertaste was - dry. The astringent qualities of the fruit dried my mouth out like there was a piece of cotton in it. They were very, very ripe - almost too ripe. Yeah, some of the natives just don't lose the last bit of astringency even when they're dead ripe. I'd say try another tree.